Giratina Origin in game: 1,692 Who? Important notice! Pokemon Giratina Origin is a fictional character of humans. Giratina (Japanese: ????? Giratina) is a dual-type Ghost/Dragon Legendary Pokémon introduced in Generation IV. Along with Dialga and Palkia, it is a member of the trio of Sinnoh, representing antimatter. 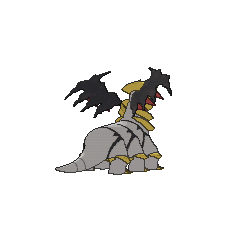 Giratina is a large gray draconic Pokémon with gold half rings circling the back of its neck. Its head has a gold crown-like object surrounding it with two large horns pointing sideways. A thick black stripe runs vertically along the front with red horizontal stripes. In its Altered Forme, it has two large black ghostly wings with red tips that can resemble claws. These wings can change shape as if it's a liquid or gas. Its six legs are thick and clawed. In its Origin Forme, it takes on a serpentine look, with six black ghostly streamers on its back with red spikes at the tips. 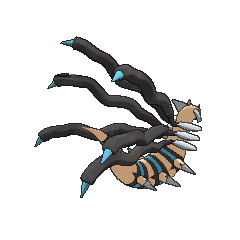 Its legs are reduced to spikes, and four additional golden spikes appear near the edge of its tail. While in Origin Forme, the three gold half-rings can grip objects. The horns on its head are now facing the back, and the black vertical stripe is broken into pieces and runs all the way down its body. It can only be in its Origin Forme when in its home, the Reverse World, or when holding a Griseous Orb. 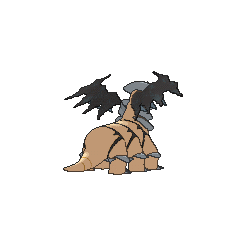 Giratina is able to travel through and control dimensions besides those of time and space. When in its Origin Forme, it is able to pass through dimensions at will, however, it will turn back to its Altered Forme due to the gravity change from the Reverse World. It does so by emitting a whirlwind from its mouth which opens a portal. It also seems to have a connection to reflective objects, such as mirrors and pools of water. Reflections embody the concept of the Reverse World. Giratina is a highly aggressive and territorial Pokémon protective of its home. Legends claim that Giratina appears in cemeteries and that it supposedly lives in a world on the reverse side. It was said to be banished for violence. Giratina is the only known Pokémon that can learn Shadow Force. Giratina made its debut in Giratina and the Sky Warrior. In the movie, Giratina ambushes and drags Dialga into the Reverse World in order to exact revenge against the Temporal Pokémon for causing damage to its home during its fight with Palkia some time before. Zero attempts to copy Giratina's powers in order to take control over the Reverse World. Throughout the movie, Giratina takes on its Origin Forme whenever it is in the Reverse World, and its Altered Forme whenever it is in the real world. Giratina makes a second appearance in the twelfth movie alongside Dialga, Palkia, and Arceus. Giratina appeared in Hoopa and the Clash of Ages, along with the other members of its trio, the Tao trio, the Eon duo, Arceus, Lugia, and Regigigas. Giratina made its TV debut in Try for the Family Stone! as an illusion. Giratina appeared in Meowth's boss fantasy in Dealing With a Fierce Double Ditto Drama!. It first emerged from the Distortion World to free Dialga and Palkia from the Red Chain. Then, it took Cyrus with it back to its home world. It was last seen in its Origin Forme, observing Cyrus as he regained consciousness, realized he was in the Distortion World, and accepted it as the new world he sought. Giratina first appeared in the Diamond & Pearl chapter, where it used its tentacles to drag Dialga, Palkia, and Cyrus into the Distortion World. Giratina serves as the main antagonist in the Platinum chapter. It had been chasing Paka and Uji endlessly in the Distortion World until it had taken Dialga, Palkia and Cyrus hostage. It then landed in the Pokémon world location of Eterna City and caused a rampage. 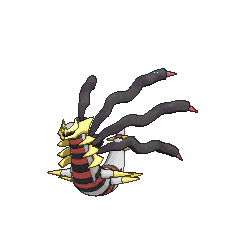 Giratina concluded the rampage by targeting Pearl with its signature Shadow Force, although Diamond took the hit for him. Reg responded to its Trainer's loss by helping Rotom change between its Formes to attack Giratina. Giratina was forced to retreat, and Charon followed it into the Distortion World. Upon arrival, Giratina was challenged by Volkner and Flint, but quickly ended the resistance of their Electivire and Magmortar. Eventually, Giratina fought Dialga, Palkia and Reg all at once inside the Distortion World. After Charon's flying craft was destroyed, he decided to retreat by commanding Giratina to fly him out of the Distortion World. However, Charon and Giratina were impeded by a Draco Meteor from Cynthia's Garchomp as soon as they arrived back in the Pokémon world. After Charon's arrest by Looker, Giratina rose again and tried to ambush Platinum but Volkner's Electivire and Flint's Magmortar finished it off. Giratina was forced to return to the Distortion World on Dialga and Palkia's command. 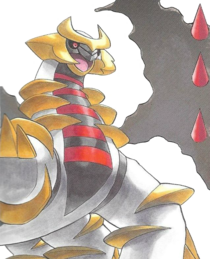 In the HeartGold & SoulSilver chapter, Giratina was breed in the Sinjoh Ruins, along with Dialga and Palkia, by Arceus' breeding process, which was forced by Team Rocket's Four Generals. Knowing that the breeding process would threaten the Johto region, Team Rocket's true leader Giovanni returned with Lance and Pryce to keep the breeding trio at bay while Gold tried to calm Arceus down. 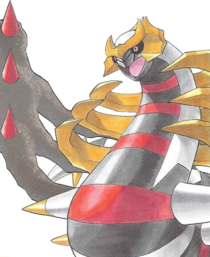 Giratina was kept at bay by Giovanni and his son's Ursaring. Once Arceus was eventually becalmed, Giratina went back to the Distortion World. 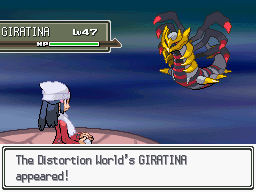 Hareta bonded with Giratina after battling it in the Distortion World. After realizing it wanted to fight, Hareta teamed up with Giratina and fought his friends in a friendly battle. 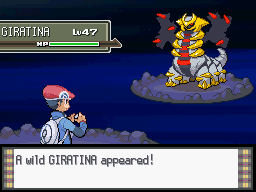 Giratina appeared in PBK5 where it fought against Yu Shirogane and lost. Giratina in Super Smash Bros. for 3DS. Altered Forme Giratina appears as a Poké Ball summon. It will use Dragon Breath to cause a whirlwind. It also causes damage on contact. 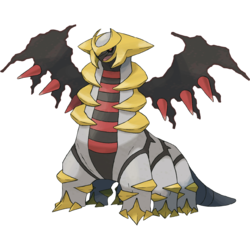 PAL: Also called the Renegade Pokémon, Giratina lives in a dimension known as the Distortion World. It has two forms, and will only be seen in its Origin Forme in our world if it's holding a Griseous Orb. Its Dragon Breath attack composes a powerful tornado that not only damages you, but can carry you off the stage! It spits out orbs imbued with loathsome emotions and composes gusts of dark wind. Giratina has the highest base stat total of all Ghost-type Pokémon. 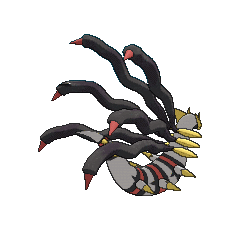 Giratina may be based on Seta, a giant centipede, from the Japanese fairytale, "My Lord Bag of Rice", which was said to prey on dragon hatchlings and be as large as a mountain. 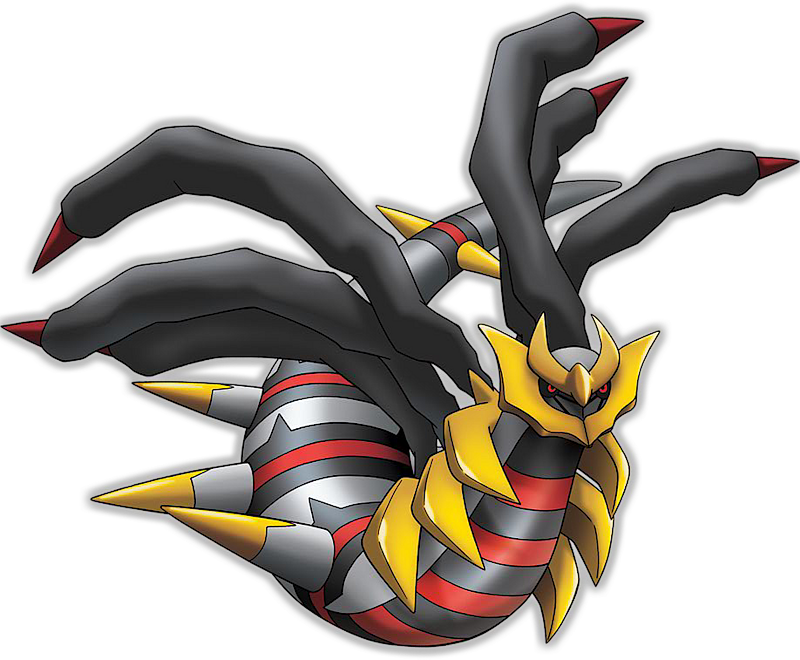 Giratina's Altered Forme is also possibly based on a basilisk, and its Origin Forme may be based on a serpent. Both formes may also be based on the Bobbit worm. In interviews Junichi Masuda and Takeshi Kawachimaru did with G4, they said that Giratina and the Distortion World were made up to be personifications of antimatter. In HeartGold and SoulSilver, Cynthia also states this. 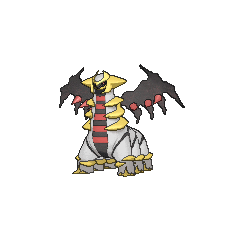 Giratina may be a combination of girasol (a type of red opal), guillotine, or girare (Italian for to wander around); and ???? purachina (Japanese for platinum).